Who could resist saying “Oh my glob” to such an adventurous tin tote exclusive? Includes newly designed tin tote, insulated container and mini journal. Entertainment Earth Convention Exclusive! Are you a fan of Adventure Time? Bif Bang Pow! sure is and we think you are too. That’s why we created this totally mathematical Adventure Time Traveling Jake Tin Tote Gift Set - Convention Exclusive. Each Adventure Time Traveling Jake Tin Tote Gift Set is a convention exclusive that comes individually numbered. This one-of-a-kind tin tote looks just like Finn’s backpack with Jake traveling inside and measures 8 5/8-inches wide x 6 3/4-inches tall x 4-inches deep. 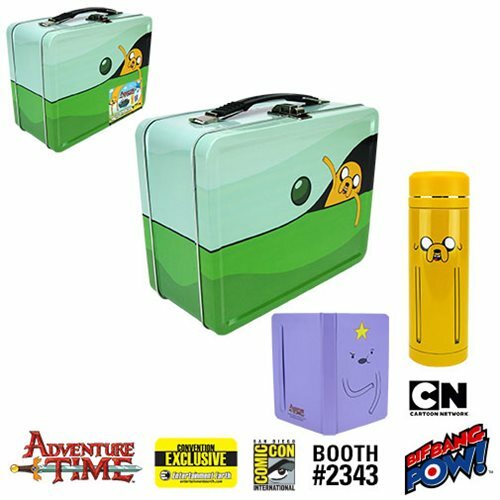 Inside you’ll find a 7 1/4-inch tall, 300 ml insulated stainless steel container featuring Finn’s best friend Jake; and a 5 1/2-inch tall x 3 1/2-inch wide hardbound mini-journal of the Lumpy Space Princess that boasts 192 lined pages, an elastic closure and a built-in bookmark. But hurry, there are only 1,500 sets of this limited edition convention exclusive! Ages 14 and up. Insulated container is hand wash only. Not dishwasher safe. Do not microwave. Thoroughly hand wash before first use.